Comrades and friends good afternoon! It is truly good to be here in St. Joseph today! It is an honor to have so revered a political thinker in Peter Wickham as our Guest Speaker. I wish to thank him once again for stepping in at such short notice to fill the slot created due to the unavoidable absence of Mr. Owen Arthur, former Prime Minister of Barbados. Incidentally, Mr. Arthur has asked that I convey to this Conference his very best wishes and sincere apologies for cancelling at the last moment. Personal issues triggered the cancellation but he has insisted that he be provided an opportunity in the very near future to fellowship with the Dominica Labour Party. Is Owen Arthur healthy enough to be Prime Minister? Some speculate that Arthur bowed out because Dominica’s Democratic Freedom Party put pressure on him, but many don’t buy that because it’s not like Arthur to misjudge the politics that badly – and it’s not like Arthur to let himself be pushed around and embarrassed. No Sir. The Owen Arthur we know would not be deterred by the DFP objection and would probably view it as a challenge to be met head-on. It’s not like Arthur to agree to a speaking engagement without considering the politics, and once committed it is not like Owen Arthur to then run from a public appearance because somebody objects. Missing in action: the Owen Arthur spark! For most observers, once you put aside a political causes for Arthur cancelling, the immediate thought is his health. It is true that Arthur hasn’t been looking well at all in the last year. He seems dramatically smaller, slower and older – and this happened in a relatively short period of time. He stoops and sometime walks with a cane when only two years ago he would rocket up steps two at a time – drunk or sober. Now he shuffles about without the spark that defined his personality and physical appearances in public for three decades. You’ll have a difficult time finding a recent photo of the Opposition leader, because for some reason the local media prefers to use file photos from two years ago. The physical also impacts one’s outlook on life and capacity for work: and Arthur has been missing in action more often than not at Parliament and party functions. His total failure to lead the BLP charge during the recent Employment Rights Bill is an indication that something is seriously wrong either with Owen Arthur’s political judgment or his health. 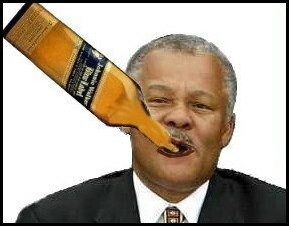 Owen Arthur’s legacy of High Debt killing Barbados. As Barbados celebrates its 45th birthday of Independence, it is clear that Owen Arthur’s legacy of high debt, accumulated during times of plenty – is now killing our country. That explains why the announcement from the Barbados Chamber of Commerce and Industry (BCCI) that he (Opposition Leader Owen Arthur) would have been addressing its luncheon on November 24th – became “big new” and for a number of reasons. That announcement was coming less than a month after Owen Arthur had spoken at his Party’s Annual Conference. Pray tell: what new or important could he possibly have had to say? This October 18th marks the first year since power-hungry opportunists ousted Mia Mottley as Leader of the Opposition. 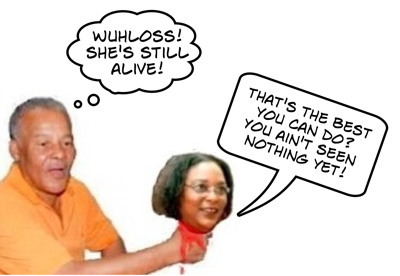 Owen Arthur and his wild boys thought they had driven a political stake through the enemy’s heart, but then four months ago Mottley announced she would run for the position of BLP Chairman. That sent Owen Arthur’s gang crazy. Not to mention that an independent poll found the vast majority of BLP members wanted Mia Mottley as leader over Arthur. In a one person / one vote contest Owen Arthur would be given his walking papers. What was Arthur to do? For Arthur and his wild boys, the decision was simple: they would just illegally change the rules before the upcoming BLP Conference. It didn’t matter that the BLP Constitution prohibits the declaration of new rules until the membership ratifies the changes. It didn’t matter that none of the general membership knew about the changes until they were a done deal. Welcome to Barbados – where rules and laws are mere tools to be wielded or ignored by those in power. Any Bajan knows that when rules or the law stands in the way of those who have power, they do what they want anyway. That is part of the reality on this island. Rule of Law is a stranger in this country and that is the truth. In her current circumstances Mia is crying victim and warning about the abuse of democracy. She is correct, of course, but how soon she has forgotten that when she was the Attorney General with the full power of a majority government, the BLP changed the Barbados Constitution at the drop of a hat with zero public discussion. Mottley chooses not to remember that her government expropriated private lands with wild abandon and often never paid for those lands. That’s called theft – but not when you are in power. And when some of those expropriated lands ended up in the hands of government ministers or their family members and friends – Mottley didn’t see anything wrong with that at the time. Yes, Mia is justifiably outraged at the abuse of democracy and the disregard for the BLP Constitution – but her outrage is selective and selfish. Where was her outrage when her BLP government habitually ignored the rule of law? On May 22rd this year, I announced my intention to contest the post of Chairman of the Barbados Labour Party. I made it clear that I was running on a platform to secure for every member of our Party the right that all Members of Parliament enjoy – to participate and vote at our Annual Conference, our highest decision-making body. Last Thursday, I received an email from the General Secretary and also a communication from the Secretary of my Constituency Branch regarding new Standing Orders for the Annual Party Conference issued by the National Council. Neither of the two communications indicated when the National Council ratified these Standing Orders. Our friend Ian Bourne says that Owen Arthur is “under tremendous pressure to ensure he attracts more people” to public meetings than Mia Mottley did when she was BLP leader. Unfortunately for Goin wid Owen, folks remember that as Leader of the Opposition, Mia Mottley attracted THOUSANDS to her meetings. That’s just not the case now with Mr. Arthur who often finds himself talking to more empty chairs than people. Some of his backroom advisors are getting a little nervous and well they should.